TLCD’s ongoing Wine Wednesday tradition is evolving and we are thrilled to welcome creative professionals to share their process, passion and artwork with our team. We recently had Petaluma sculptor Matt Devine join us and he brought many small scale pieces which he encouraged us to touch and examine. Matt works in metals… steel, aluminum and bronze and achieves beautiful variations depending on the metal and the finishing treatment. Matt was commissioned by TLCD to create a custom installation at our American AgCredit project in Santa Rosa. It doesn’t get much better than designing a building from the inside out, with custom furniture solutions and an amazing collection of art. Representation in the San Francisco Bay area is by Simon Brietbard Fine Arts. When it comes to “High Performance,” are you up to snuff on the best available tools? 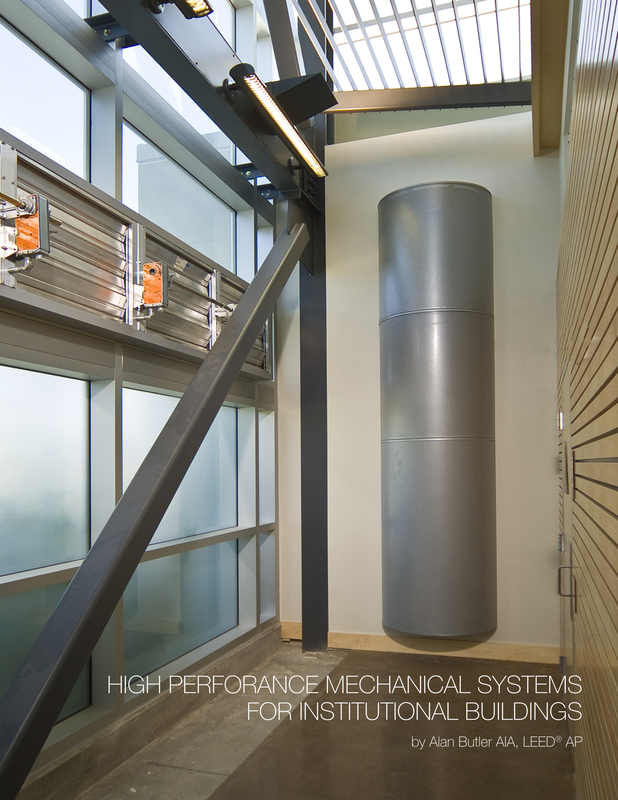 In his latest whitepaper, Alan Butler– with the help of Mechanical Engineers Tony Costa (Cost Engineers, Inc.) and Mike Lucas (Alfa Tech)–has compiled a careful study of the best high performance mechanical systems for institutional buildings. The research ranges from popular displacement ventilation systems to less well-known enthalpy wheels and geothermal systems. 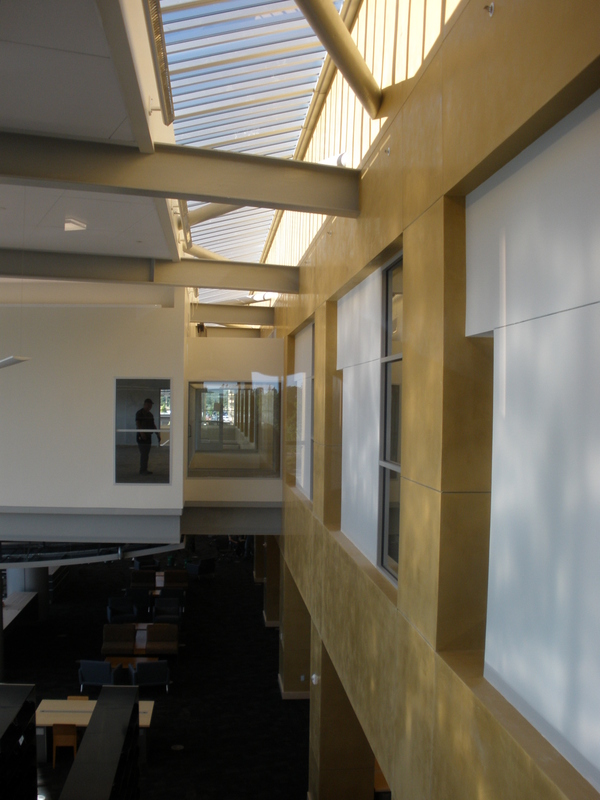 To learn more about today’s energy efficient systems for your latest building or project, download the whitepaper here. TLCD Architecture formally announced yesterday a contract agreement with the Administrative Office of the Courts (AOC) for architectural services for the New Lakeport Courthouse to be built in Lakeport, CA. Teaming on this effort are Santa Rosa’s own TLCD Architecture and Boston-based Shepley Bulfinch (with whom TLCD paired on the Doyle Library). The release announces the contract signing milestone, and includes a brief discussion about the project and site selection. Read the press release here. 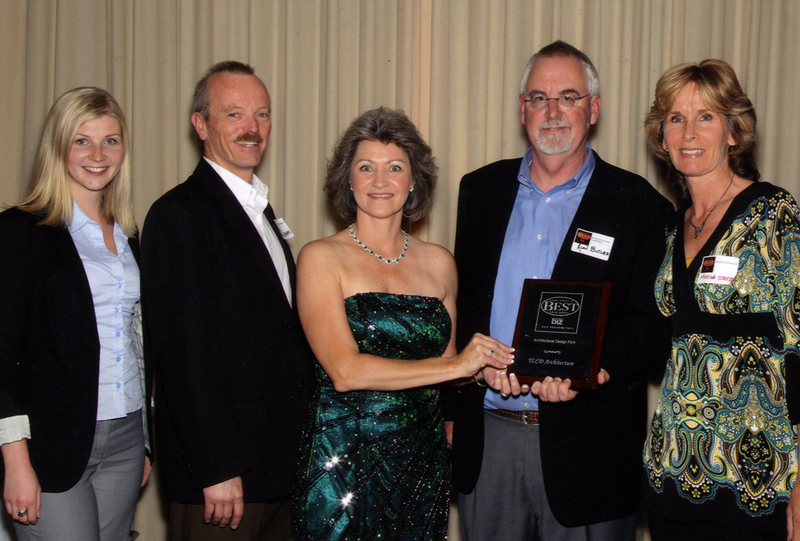 NorthBay biz magazine held their annual “Best of” event on Thursday evening at the Santa Rosa Golf and Country Club. TLCD was honored with a Gold Medal award, received by Alan Butler, Mark Adams, Marina Starkey and Sara Thompson. Alan also received the award for the Redwood Empire Food Bank for Gold Medal in the Nonprofit/Charitable Organization category. This was the magazine’s 21st year conducting their annual readers poll, and the 9th year hosting the event. In total more than 2500 reader ballots were cast, which translated to 43,000 votes in 38 different categories. Norm and Joni Rosinski–the publishers of the magazine–were dressed to the nines to present awards to 80 award-winning North Bay companies. Upon receipt of their respective awards, local business people were given the chance to say a few words. Their passion for their work and appreciative spirit were welcome, especially in recent tough economic times. Set by the golf course with plenty of festive food and wine, this event made for an enjoyable evening. Seven “Best of” wineries poured their renowned wines, including La Crema, J Vineyards and Winery, Honig Winery, Hanna Winery, Chalk Hill Estate, Siduri Wines, and Jordan Vineyard and Winery. TLCD looks forward to participating again next year! No, in fact, it doesn’t. This local news headline came from none other than Lance Armstrong in response to Monday’s chilly rainfall over the Amgen Tour of California bicycle race. The 110-mile second stage of the race drenched cyclists through a tour of Sonoma County in cold and unrelenting rain over four intense climbs. But the wet weather did not keep TLCD race fans away; a few staff members bundled up to cheer the racers across the downtown finish line. Santa Rosa resident and three-time defending champion Levi Leipheimer finished in the main group and is in 12th place overall. He is 10 seconds behind new race leader Brett Lancaster with six days of racing remaining. 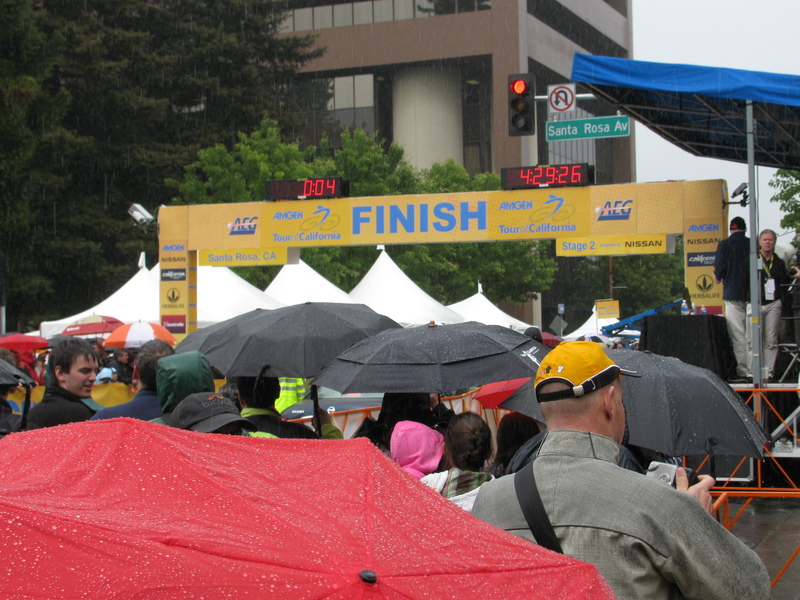 Although the weather did not cooperate with the Amgen race schedule, Santa Rosa is still an enthusiastic host of this race. “The national exposure for Santa Rosa and Sonoma County is phenomenal,” said Mayor Susan Gorin. In the days to come, Santa Rosa will continue to buzz about the race and will keep up hope that Team Radio Shack (including Lance Armstrong and Levi Leipheimer) will take the lead. 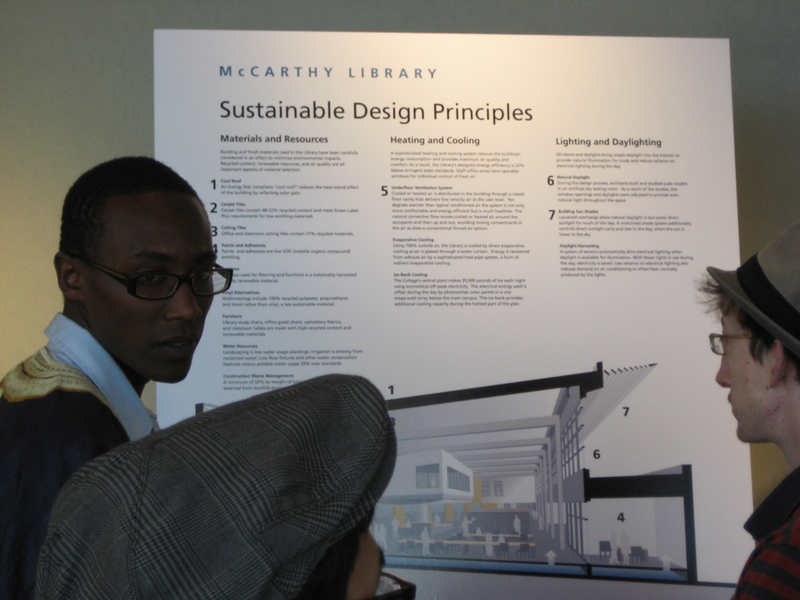 Marina took these photos of students checking out the Sustainable Design Principles sign at the McCarthy Library Opening. A version of this sign will eventually be incorporated as a permanent feature of the library. History was made at Napa Valley College yesterday afternoon. 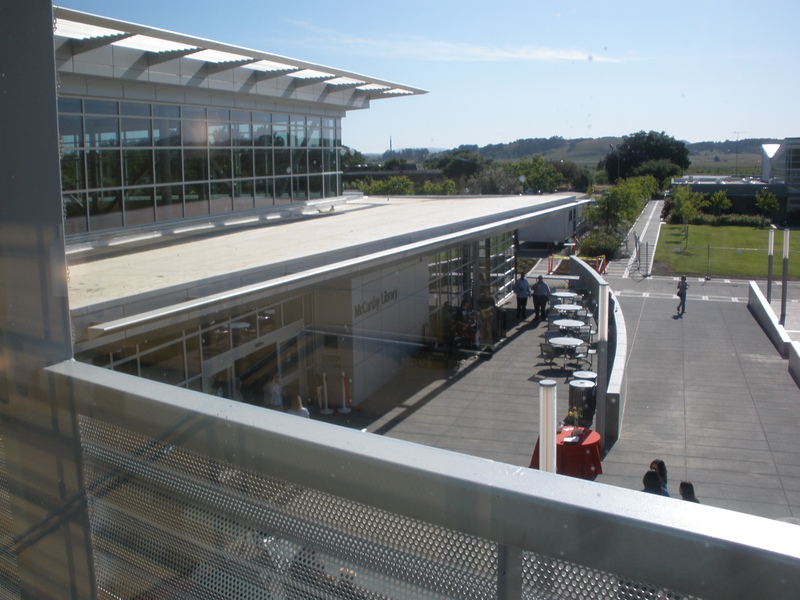 Around four o’clock, a large group of community members, campus staff and administrators, librarians, architects, contractors, engineers, parents, friends, and students gathered for the opening of the new McCarthy Library. 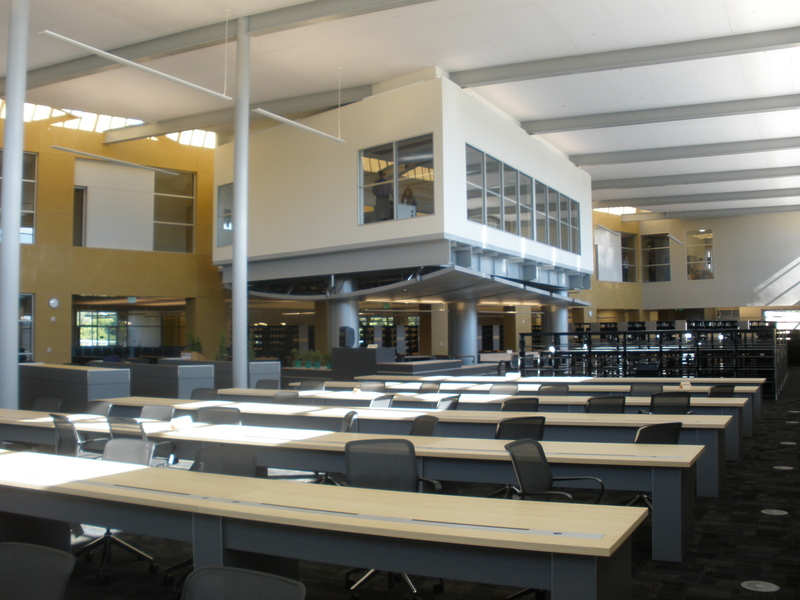 “This new building,” as described by Interim Superintendent/President Armond Phillips, “will be the hub of campus activity and a place for student learning and achievement for years to come.” The building is appropriately dedicated to the late NVC president, Chris McCarthy who advocated for student learning throughout his career. The short presentation also included a few heartfelt words from Dean of Library and Learning Resources Bonnie Thoreen, Vice President of Instruction Sue Nelson, and Director of Campus Planning and Construction Dan TerAvest. The presentation was concluded with a reading of “The Library,” a poem by Napa Valley Poet Laureate, Gary Silva. 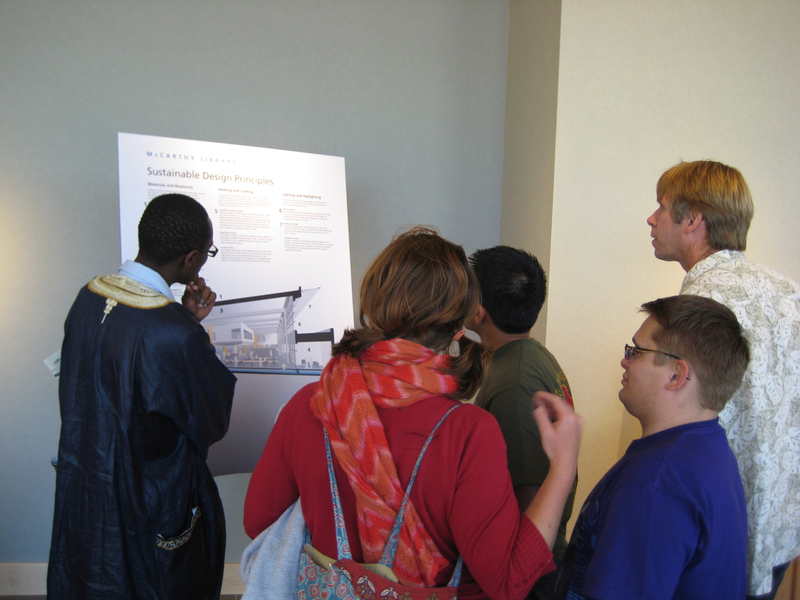 The event proceeded with self-guided tours of the new building, live music, and food service from the new cafe. The mood was grand in celebration of this beautiful new building. The only argument I overheard was between a group of librarians debating who had the coolest office! Congratulations to the TLCD team and everyone involved with this project. It is something you should all be very, very proud of.